You hear about them so much, you feel like you know them: the Kings Louis of France (how do you make "Louis" plural?!). But how well do you know them? Do you know which one had a mistress (if you guessed all of them, you're probably close to correct). Who had the famous mistress Comtesse du Barry? Which was beheaded? Who ruled the longest? Who was the last King Louis? And why does anybody still care? It's not quite as simple as you think, given that most people think of the Louis-es (that plural looks weird) as a trio: XIV, XV, and XVI or, perhaps, as a foursome starting at XIII. But of course, they didn't just start at Lucky 13. The first Louis, known as "the Pious" and "the Debonair", was the son of Charlemagne and ruled way back in 814-840. His grandson, Louis II ("the Stutterer") ruled only from 877-879, and that king's son, Louis III (let's call him "the Nicknameless"), ruled till 882. All of these were part of the Carolingian Dynasty. Half a dozen kings go by, changing dynasties each time, and choosing names for themselves like Carloman, Odo, Rudolph, and often Charles, till we return the Carolingians -- and the penchant for the name Louis -- back to the throne. In 936-954, Louis IV ("of Outremer" meaning "from overseas") ruled, then Outremer's son, then Outremer's grandson, Louis V ("the Lazy") from 986-987. He didn't rule very long. Probably because of the laziness. He was so lazy ("How lazy was he?") that he ended the Carolingian Dynasty for good. Or for bad, if you were a Carolingian. The fifth rule of the new Capetian Dynasty chose the name for himself of Louis VI (though I'm guessing he didn't choose the nickname "the Fat" himself) and ruled from 1108-1137. His son Louis VII ("the Young") was king from 1137-1180. After "the Young's" son ruled, his grandson also did, as King Louis VIII ("the Lion") from 1223-1226. Three kings later, the great-grandson of Le Louis IX became King Louis X ("the Quarreller"), from 1314-1316. Many kings, several different dynasties, and over a century later, we see King Louis XI (known as "the Prudent", "the Cunning" and -- I'm not making this up -- "the Universal Spider") on the throne from 1461-1483 as part of the House of Valois. I am now dying to know: what is a universal spider? I'm suspecting it's not a great compliment. Two kings later, Louis XII ("Father of the People") reigned from 1498-1515. He was the second cousin of Louis XI, and also his son-in-law. With a family lineage that approaches Greek tragedy, the Father of the People later married his father's widow (from a second marriage, not his own mother, thankfully). For somebody known as a Father, his own family tree was fairly messed up. Another half-dozen kings later, we are finally in the House of Bourbon, at Louis XIII ("the Just"). Ruling from 1610-1643, he was the start of a stretch of long-ruling, more famous Louiss (nope, don't like that plural, either) with more flattering nicknames. Louis XIV ("the Sun King", "the Great") was one of France's, Europe's, and the world's longest monarchs, from 1643-1715. Louis Quatorze (which means "14") is the most famous of all the Louis-s (ugh) and the one most people picture which his foppish, fancy clothes. Gigi recently had to do an interview in which she was asked, "If you could go back in history and have dinner with anybody, who would it be, and what would you eat?" After clarifying that the menu didn't have to be realistic to the era or location, she chose to go back and eat tacos and Spanish tortilla (like a potato-onion frittata) with King Louis XIV. Frankly, that sounds like a pretty fun meal to me, too. The Sun King ruled for so long, he outlived his son and grandson. 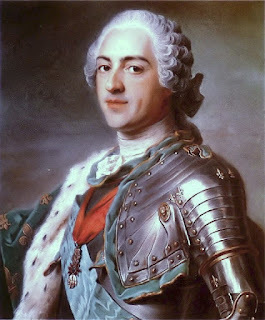 So his immediate successor was his great-grandson, Louis XV ("the Beloved") from 1715-1774, also a nice, healthy, long reign. He was the king who caused a great scandal by being very public about his "favorite", long-time mistress Madame du Barry, whom he honored as Countess, and who was loathed by much of the court for being born a commoner. And for being the King's favorite. "The Beloved" in turn ruled so long that he outlived his son. His grandson took the throne in 1774 as King Louis XVI ("the Restorer of French Liberty"). It's fascinating that he was known as the Restorer of French Liberty, given that he was beheaded by revolutionaries in 1792. The King Louis presence is felt everywhere: Here, in the 1st arrondissement is a plaque, all in Latin, to Louis XVI for his restoration of this public fountain. Given that Louis XVI, husband to the very famous Marie Antoinette, was beheaded and that the French revolution established a republic in 1789, you would think that that would be the end to the Louis-es. But you would be wrong. 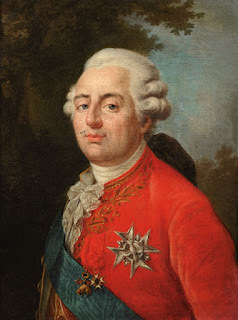 Their son, Louis XVII ("the Claimant") survived until 1795, growing up in a prison till he, too, was killed, but still considered by royalists (at the time and even since) to have been king. Powerless, mind you, and a child, but king. Napoleon Bonaparte returned from exile on March 19, 1815 and re-entered Paris to cheers and shouts, with absolutely no fighting. 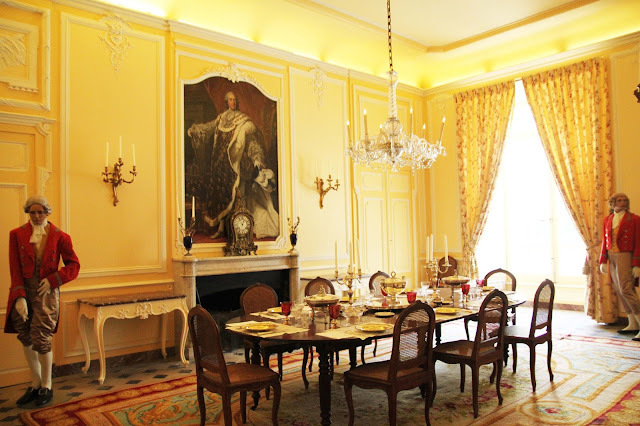 Louis XVIII heard he was returning and fled in the early evening, so that Bonaparte literally sat down later that night, peacefully, to a dinner that the chef had prepared for King Louis XVIII. To confuse matters more, that same King Louis returned in July 1815 (after the reigns of both Napoleon I and II in just those four months) and once again ruled France for many years -- till 1824. Even though we are now well into the 19th century and well past the French revolution, we are still not done with the Louiszzz. Louis XVI's and Louis XVIII's younger brother then became king, and in turn his son, King Louis XIX ("Antoine"), ruled for 20 minutes on August 2, 1830. Yes, I typed that correctly: 20 minutes. I suspect he went onto the throne being called Antoine, because he certainly didn't have time to earn a nickname. Why are any of these Louisisis important? Because they really are a ubiquitous part of French culture, not just the history. They come up in so many place names, literary and artistic references, and of course, there's the furniture. The trained eye can spot and identify a dozen Louis Something antiques and decorative styles in these photos. Not my eye, however. 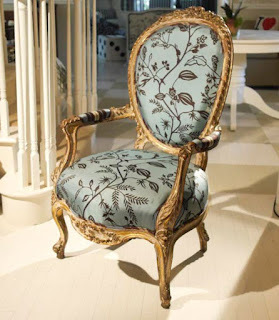 What's the difference between a Louis XV and XVI armchair? 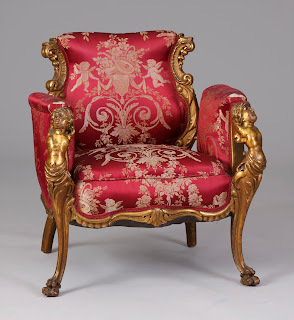 In my search for photos of specific styles, I stumbled upon exactly the guide to the Louis chairs I would have written, if I only I knew anything about chairs. You can learn all about how to understand the difference at Peonies and Orange Blossoms, and I'm not even going to bother trying to pretend I can explain the differences to you. All I know is that some chairs are fancier than others, and some are more expensive, and it's not always obvious why. The chairs may remain a mystery, but in our family, Gigi, the history buff, knows her Louis-eses the best. When we see a portrait, she can generally tell us "That's King Louis XIV" just by looking at the clothing and especially hairstyle. "But Mom, it's easy! Louis XIV is the one with that huge valley in his hair." Louis XV and XVI look a lot like the classic George Washington image (similar era, so I guess not so surprising), and XV almost always looks a whole lot cooler than XVI. Now I know. I may not be the Louis savant that my daughter is, but having lived here, visited numerous museums, enjoyed some historical fiction, and read about a gajillion historical placards, I can now keep most of my Louis's -- and sometimes even their paramours -- straight. Though I cannot figure out how to write "Louis" in the plural. Made by the Guillet family in Touraine, this farmhouse cheese made from raw goats' milk is the height of elegance. Starting from its name, which means something like "The Marbled One from the Loire" to the gorgeous veins of ash running through it, to the perfect balance of flavors and texture, Marbré de Loire is a real treat. In terms of the marbling, it's reminiscent of a Maucaze Marbré, but with its own character. Marbré de Loire is so beautiful, you'll almost not want to eat it. Almost. The texture is silky and soft, and all the right notes are there: salty, sweet, buttery, flowery, herbal. The ash does not actually alter the flavor noticeably, but it certainly does make it look like a slab of streaked marble. Here's that portrait of King Louis XV seen close up above, in coronation robe, hanging over the Louis XVI marble mantle, though this particular château is not in the Loire but rather in Burgundy. Still, everything about it -- the furniture, the decorations, the painting, and the history screams Louis Something or Other. Now you just need to know your Louis's well enough to figure out which one. By the way, I don't know if Louis VI ("the Fat") got fat eating lots of delicious cheese, but it's a distinct possibility.